Summer is in full swing here in the great state of Texas. Temperatures have soared over 100 degrees a few times, and my creativity, inspiration and motivation have soared as well. 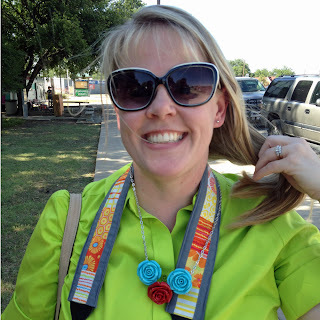 I've been busy trying new things this past month and want to share some of that with you today as I begin a blog break for the month of July. 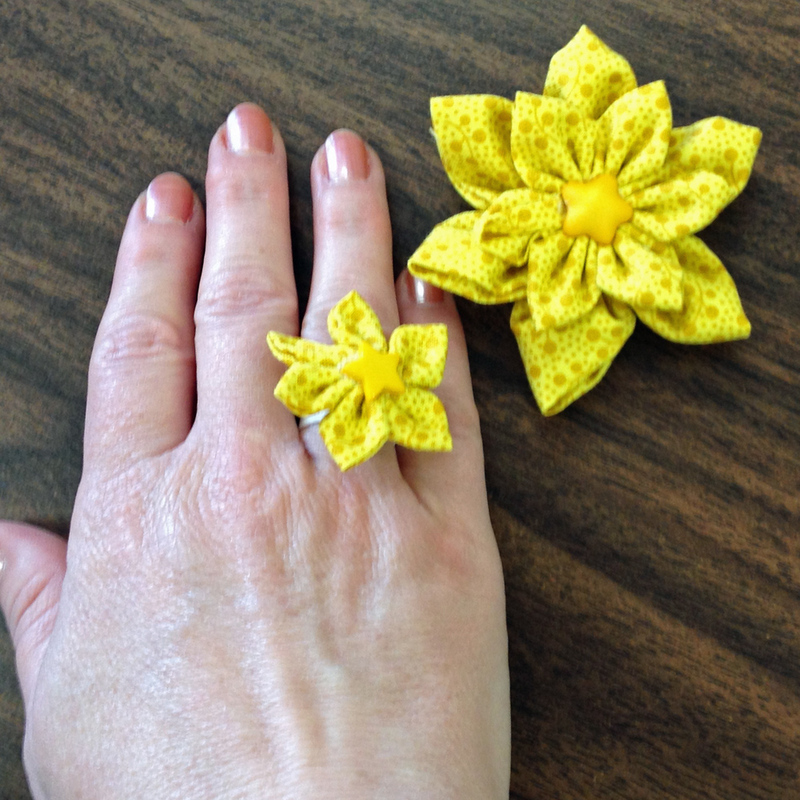 I ended up with a double flower that I will either use on a layout (or as an embellishment on a ponytail holder) and a flower ring. 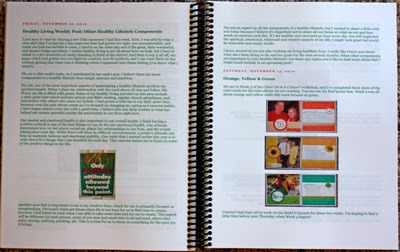 The second class was a free class offered at our local library and involved covering journals. 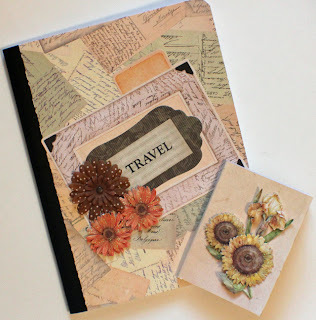 While I've covered journals before, I thought it would be fun to check out the class and meet new crafters. 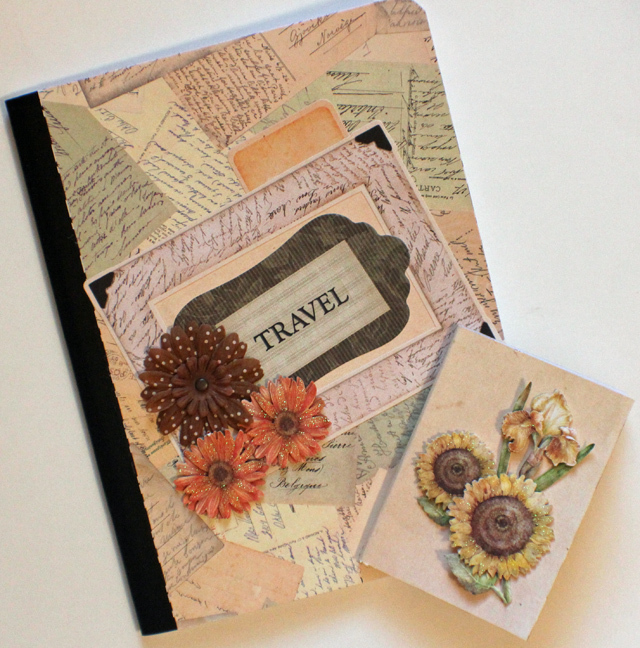 The journals and all the supplies were provided, and I am thrilled with my covered journals. My twin nieces were here for their summer visit and I signed us all up to attend a paint class where we all painted The Whimsy Tree. 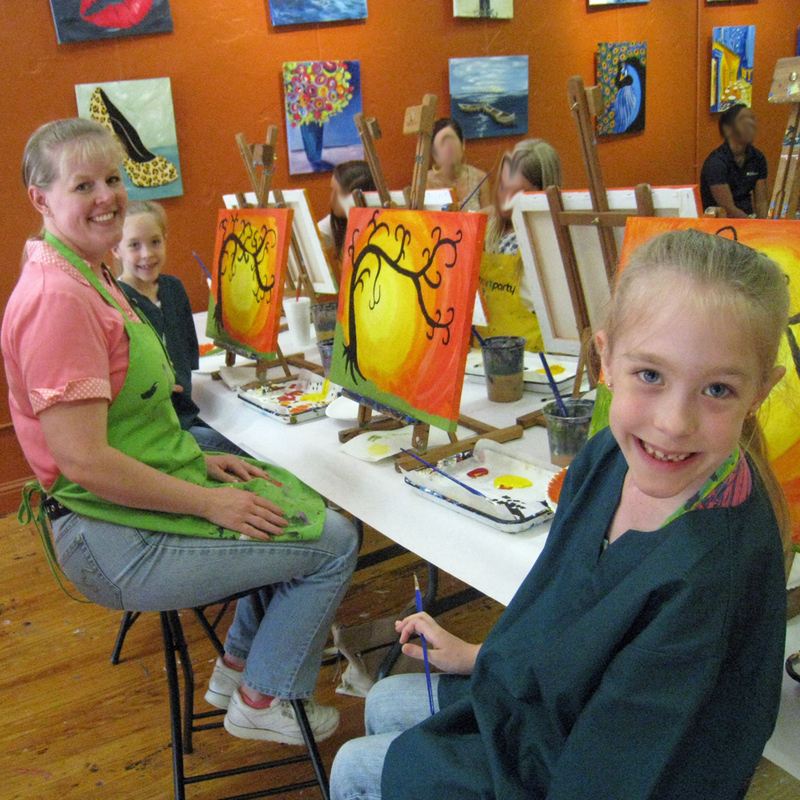 My friend Ellyn and her sweet daughter Ally joined us for this fun adventure. I love how all our paintings are the same yet different. 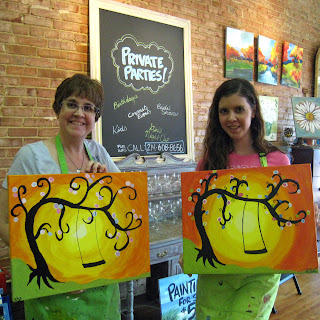 Paige's painting most resembles the class painting as she was meticulous in following the directions and was able to paint very skinny branches (a feat that eluded me!). 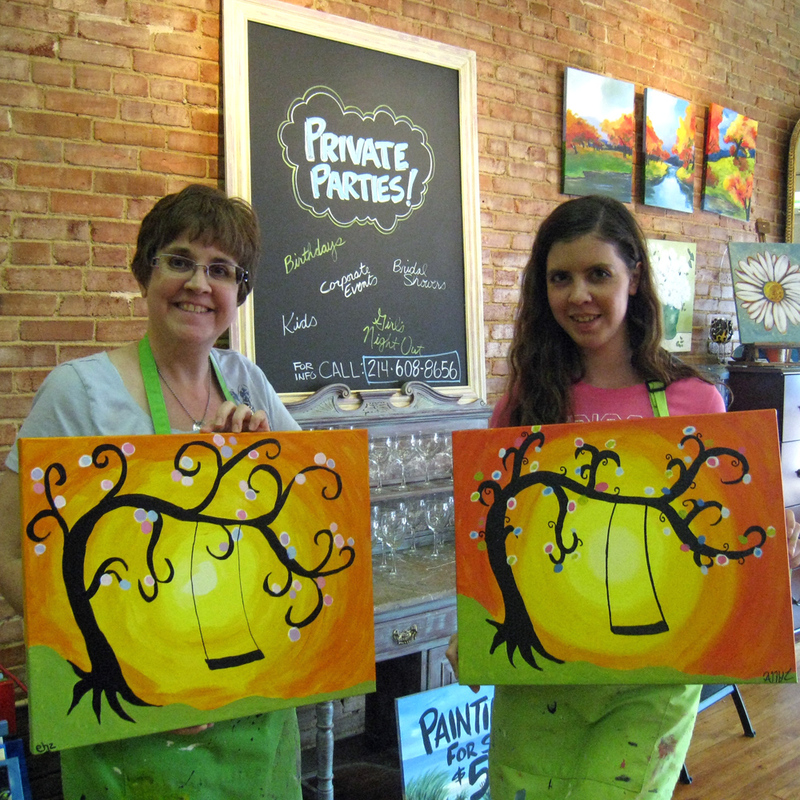 Laurie's painting is the most unique as she continued to add branches and baubles to fill the space and included every color of the rainbow. I added my own touch by making my swing a two-seater (because I, of course, wouldn't want to swing without Robbie!). 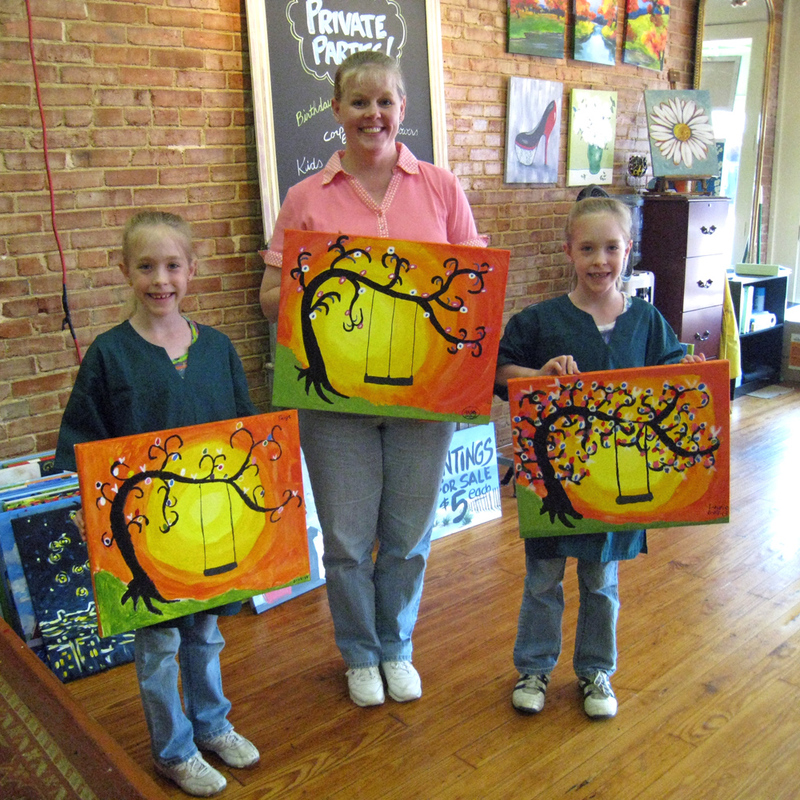 Ellyn, who loves bright colors, ended up with the most beautiful pastel painting of all, and Ally was so inspired that she went home and painted some mini-canvases that afternoon! Robbie bought me a copy of the Better Homes & Gardens Make It Yourself magazine that had an entire article on using twine, and the twins and I made these flowers based on one of the tutorials. Robbie and I also took a 500 mile road trip and captured 12 items on Rinda's 2013 Summertime Photography Scavenger Hunt! 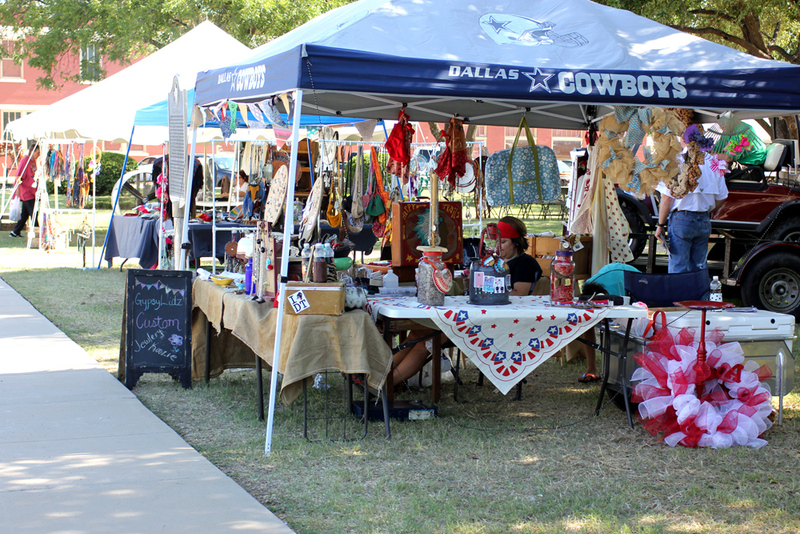 Here's a look at #1 - Open Air Market, which we just happened upon as we drove through Albany, Texas. Robbie made a quick turn to find a parking spot and we trekked across the highway in 105 degree temperatures to snap a photo! The event had not really started when we happened upon it, but I did find this wonderful three rose necklace before we scooted back across the hot highway to the air-conditioned Suburban (did I mention that it was 105 degrees!). Over the past couple of months, I've been the lucky recipient of some fantastic packages so I have several pieces of Happy Mail to share with y'all today. 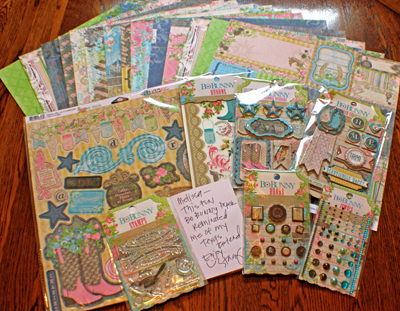 Once the Finding Photo Freedom workshop concluded, I received this entire kit of Bo Bunny products from Stacy Julian. I haven't quite decided yet how I'll use these items, but I do believe that this could be the beginning of a fun mini-album. Thanks Stacy!! 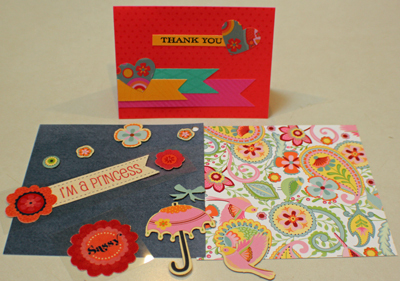 This cute Thank You card from Cheryl arrived with a couple of 6x6 papers and matching embellishments. This package arrived a while back and I've already used one of these papers and a couple of the flowers! Thanks Cheryl!! A couple of weeks ago, Helena blogged about an entire bouquet of flowers she crocheted and offered to share some to those who left a comment. I had completely forgotten about it until these beautiful blooms arrived in my mailbox a few days ago. I do think these would look great on a layout, or maybe as an embellishment on a ponytail holder - I just can't decide, maybe one of each. Thanks Helena!! Finding a happy mail package nestled among the bills and advertisements in my mailbox always makes me smile - I hope you are having Good Mail Days, too! In general, we enjoy a quiet home - the TV is rarely on; the stereo hasn't been used in ages; even our washer and dryer run so quietly we rarely hear them (until the End Cycle beep signals it's time to switch loads). I have always preferred quietness and remember as a child closing myself in my bedroom to read a good book while the rest of the family watched TV in the living room. However, I have come to enjoy listening to podcasts and the occasional audio book while I scrapbook. So today I'm sharing links to a few things I've enjoyed listening to lately. Paperclipping Roundtable - this weekly podcast is designed to "inspire, educate and entertain" with weekly discussions on a variety of scrapbooking and papercrafting topics. Two recent favorites are Episode 160 discussing layering on layouts and Episode 159 with Stacy Julian and Debbie Hodge discussing the creation of online courses. J.R.R. Tolkien reading from a chapter from The Hobbit - this rare recording features Tolkien reading from his own work and gives us a glimpse into Tolkien's imagination as he portrays the game of riddles between Bilbo Baggins and Gollum. Adventures in Arting podcasts - Julie Fei-Fan Balzer and her mom host a podcast discussing their artful adventures. There's normally a guest on the podcast, however one of my recent favorites was Episode 12 where Julie and her mom discuss going to museums. 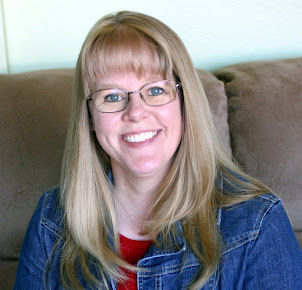 Stacy Julian podcasts - Stacy has five podcasts on her recently redesigned blog. 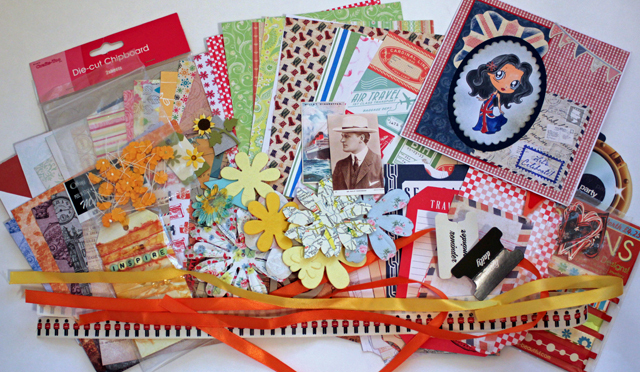 Two of the podcasts walk you through step-by-step to complete a scrapbooking project, however my favorite was the one about Creative Growth. I hope you'll check out some of these links and have a listen while you scrap and let me know what you think. And if you know of other interesting listening around the web, please leave a link in the comments so I can check it out! I've written a book each year for the past three years . . . and I bet many of you have, too! There's only one copy of each of these "self-published" books and they reside on a shelf in my craft room. I've taken the posts from my blog and formatted them into a book for each year that I've been blogging. Originally I looked into the idea of a Blurb book or something similar, but I was unhappy with the limited formatting options and the amount of time it would take to edit each one. So, I simply copied my blog posts into a Word document and formatted them to my liking. I printed these at home, then had them bound at our local Staples. It makes me smile to see these books sitting on the shelf, showcasing my writing and crafting and thoughts and ideas over the past few years. 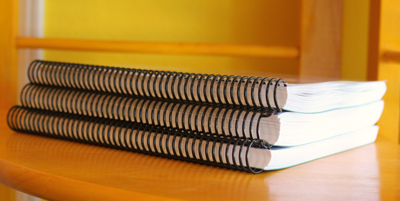 Have you turned your blog into a book? Which format did you use? 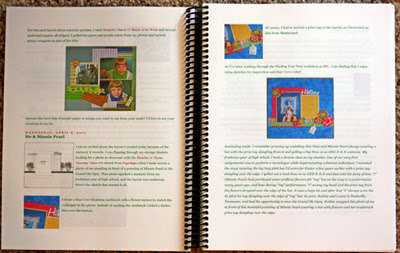 I did not sign up for the Multi-Photo Solutions workshop at BPC last fall, however I couldn't resist signing up for the rerun this summer since all my storage binders are full of photos waiting to be scrapped and this workshop promised "dozens of creative solutions for scrapbooking stacks and stacks of photos." The first week's materials were posted this past Thursday with Aly Dosdall's ideas for a single page and a double page layout using multiple photos. 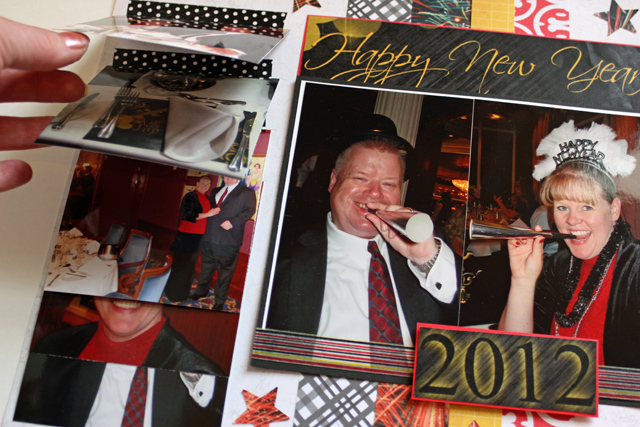 I adapted the single page idea (which contained 12 smaller photos) to work with the 7 photos I had from New Year's Eve on our cruise. 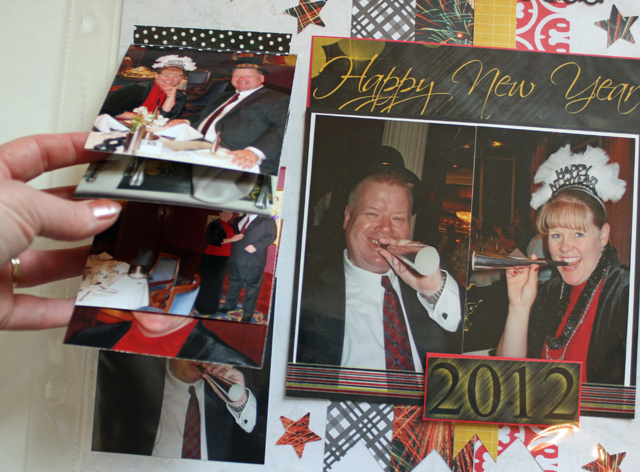 The idea was to put your best/favorite photos on the right side of the page, then overlap the "average but expendable" photos in a flip book fashion on the left side of the page. 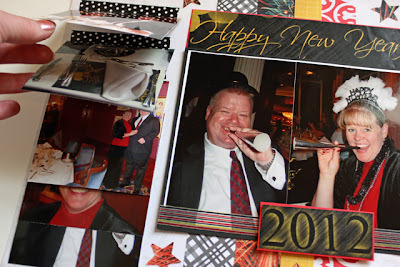 I like this idea and the opportunity to include extra photos on a layout, however Aly assumed these "average but expendable" photos would only be accessible if the page were removed from the page protector. 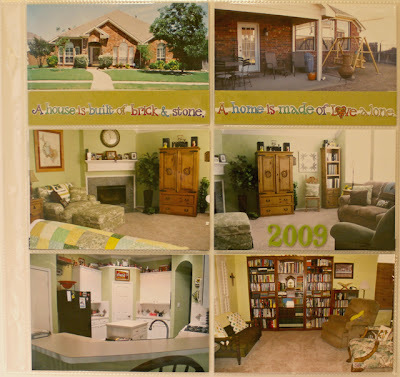 I do not like the idea of having photos on the page that can't be viewed while flipping through an album. So, I decided to cut slits in my page protector to allow the photos to be viewed. Here you can see my page in the protector. 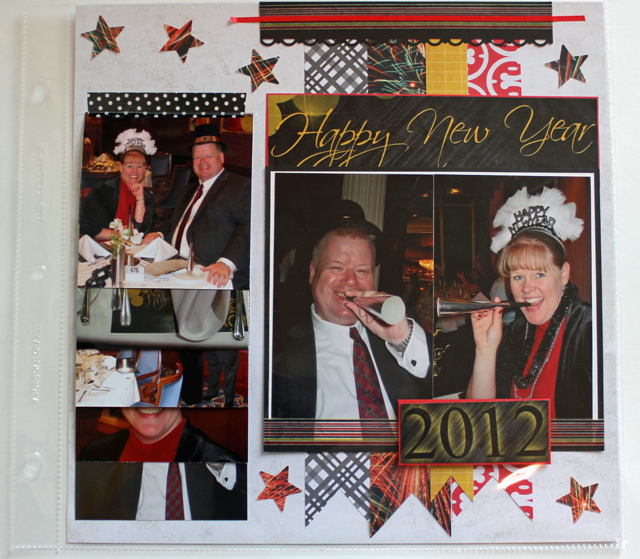 The photos are held in place by washi tape. I used one of my heavier tapes and also included a strip of tape on the back side of the photo (once it was flipped up) for added stability and endurance. 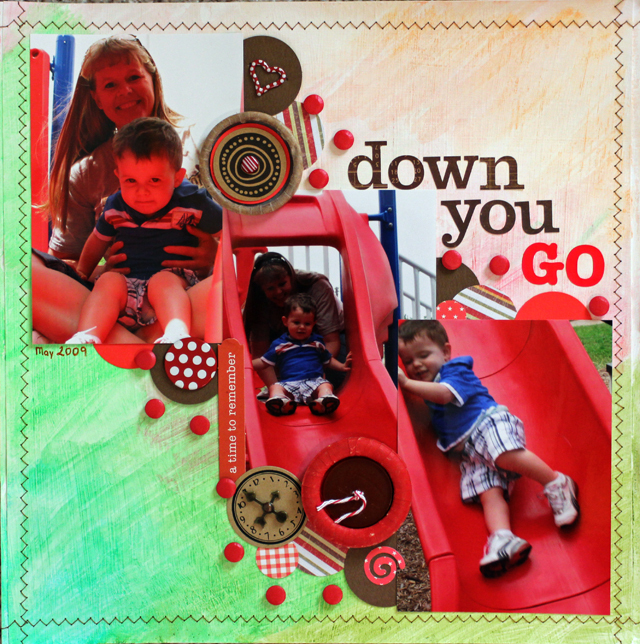 Have you added any fun interactive elements to your layouts lately? I flipped through my storage binders and found three photos from our visit to a drive-in theatre last year. I took a photo of the movie screen before the movie started, however except for the moon off to the right side it wasn't a very interesting photo. I decided it provided the perfect spot for my journaling. What do you think? Do all those hodge podge pieces go together after all? After dry blending my new Gelatos to create a background, I decided to try for a watercolor-look by blending them wet. Did you notice the other new-to-me technique on this layout? 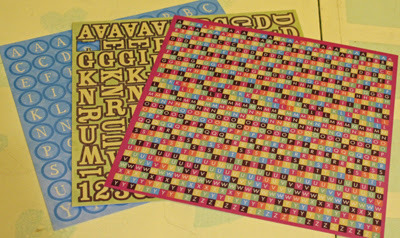 Yep, machine stitching all the way around to create my very own unique background for this layout with lots of little bits & pieces added from my red and brown color bins. 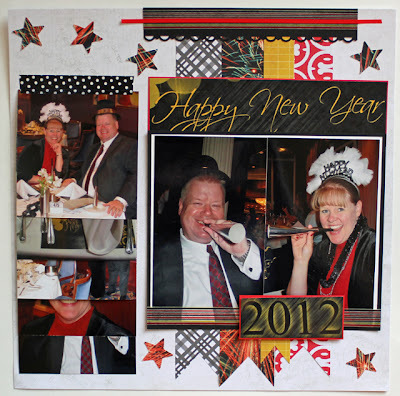 Have you created your own background lately? What mediums did you use? Inspired to work with the kit/collection I've had in my stash, I completed three more layouts before adding the remaining items to my stash. This first layout is my favorite of the three. 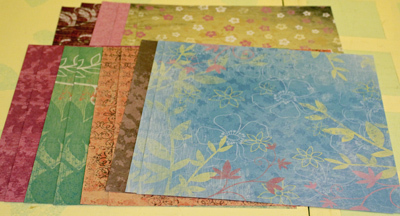 I started with a paper from the kit but ended up adding a sheet of cardstock and several other patterned papers from my scraps as well. 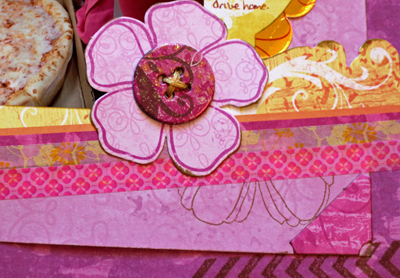 Once again I added a little stamping in the corners to finish the layout. For the next layout, I had a good bit of journaling, so I printed it directly on to one of the patterned papers to start. I used a couple of pieces of memorabilia (the wrist band and postcard) and added some washi tape from my stash. I used four sheets of the patterned paper from the kit for this last layout, layering them in smaller and smaller squares. There were only four full sheets of patterned paper left over after five layouts (see my other two layouts from this kit here and here), along with the three partially used letter sheets and a good bit of the embellishment punch-outs. I've incorporated these remaining items into my stash by color. Do you typically have lots of items left over from a kit? Or do you use it until all the pieces are gone? I remember a time when the only way to read a book was to actually own or borrow an actual printed book - hardback or paperback. And although I still love the feel and smell of books, I enjoy the fact that we have so many more options available to us now. The three books I completed recently are great examples of this variety. I ordered a used paperback version of The Story of Beautiful Girl by Rachel Simon because the description of the main characters (Lynnie - a young white woman with a developmental disability, Homan - an African American deaf man, Martha - a retired widowed school teacher, and Julia - a baby girl) drew me in. Having grown up in a home with Sister (my mentally and physically handicapped aunt), I'm always intrigued by stories that include people with disabilities. Maybe because I am a teacher by passion and training, the inclusion of the retired school teacher captured my curiosity, too. I was not disappointed - this was a page-turner, can't-put-it-down kind of book that covers forty years in the lives of the characters as they struggle through obstacles that include a state institution (the School for the Incurable and Feebleminded), a secret that haunts the young white woman, a pact to hide the baby that causes numerous moves and lies, and misunderstandings to the disabilities involved. 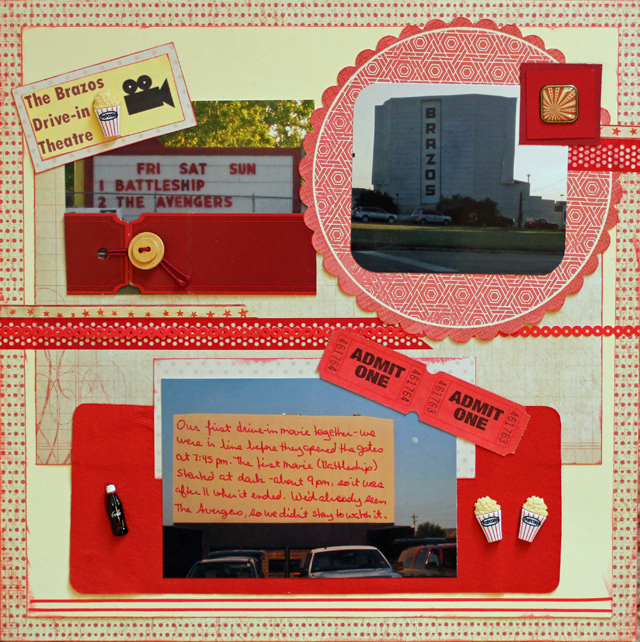 The story begins with Lynnie and Homan escaping from the institution, Lynnie giving birth to the baby girl, and the three of them arriving on Martha's doorstep shortly before the authorities arrive to return Lynnie and Homan to the institution. Lynnie is returned, Homan escapes, and Martha vows to hide the baby. I'm not giving away any spoilers on this one - you'll have to read it for yourself!! I downloaded The Sky Beneath My Feet by Lisa Samson (free from Booksneeze) to my Kindle. This Christian fiction book focuses on Beth and her thoughts and epiphanies as she deals with: her husband (the Men's Pastor at a large affluent church) who decides to hole up for three weeks in their shed waiting on a revelation from the Lord; her youngest son who is smoking marijuana; her own uncertainty about who she is and her lost dreams, etc. Honestly the story was ok, however I wouldn't recommend the book as it was slow to get into and I never felt a connection or interest in the characters (if that makes sense!). Despite understanding that the author was showing us a change in Beth from a pastor's wife going through the motions to someone wanting to make a difference in the world around her, the story just didn't draw me in. I downloaded a pdf file of Crafting Your Business by Lain Ehmann to my computer and learned a great deal from Lain's 30-day plan for creating an online business. I was most interested in the suggestions for purchasing your domain name and using Wordpress as a blog platform as I am looking into making a few changes in my blog over the next several months. This was an easy-to-read, practical guide that I would definitely recommend for anyone interested in building a business online. Isn't it amazing that we can read a printed book or a book on a Kindle or a book on our computer or even use an app to read a book on our smart phones! What book formats have you been reading lately? Sunday Musings - Is My Angel Yawning? After hearing a sermon on angels and a reminder that there are angels sent to protect us, I've been pondering this question lately. I'm wondering if I've become so comfortable and complacent in my life that I don't have a need for protection from the enemy. Maybe I'm not a threat at all, despite the fact that I want to be one of those Christians (like this quote I don't know the source of says) that when my feet hit the ground in the morning, Satan says, "Oh no, she's awake." 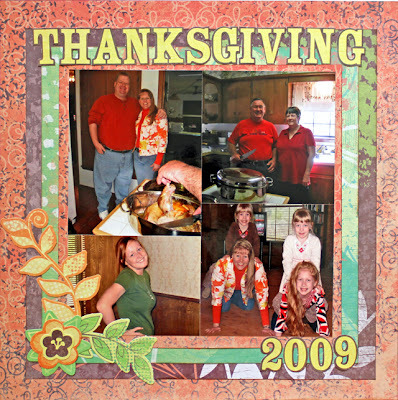 A quick layout to share today in memory of my Uncle Bill who passed away in 2009. Uncle Bill was my Grandma's brother, therefore he was actually my great uncle. 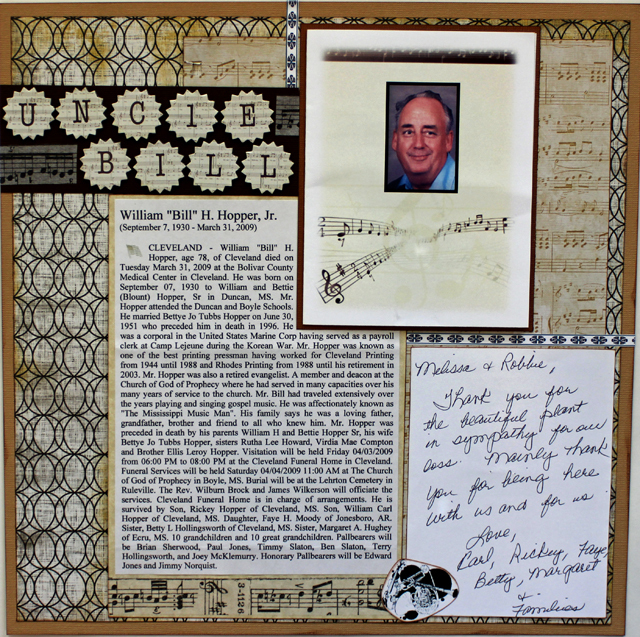 He loved to play and sing gospel music, so I chose some papers, washi tape, and letter stickers with musical notes to go on a layout with his obituary and funeral program. I like to add these memorial pages in my scrapbooks because I think it honors the memory of the people we love. I enjoyed reading Uncle Bill's obituary again and remembering times we visited him and his family when I was a child, times me and Grandma visited him in my adult years, and the last few visits in the years since Grandma's been gone. He always had a smile and was genuinely glad to sit and visit a spell anytime I was passing through. 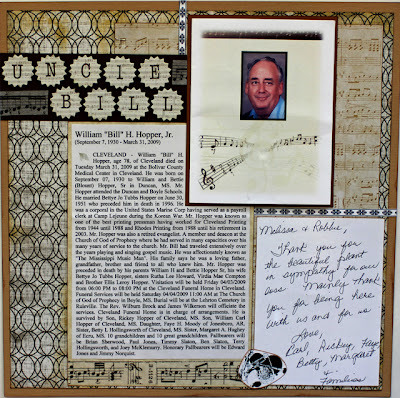 Do you create memorial pages in your albums? 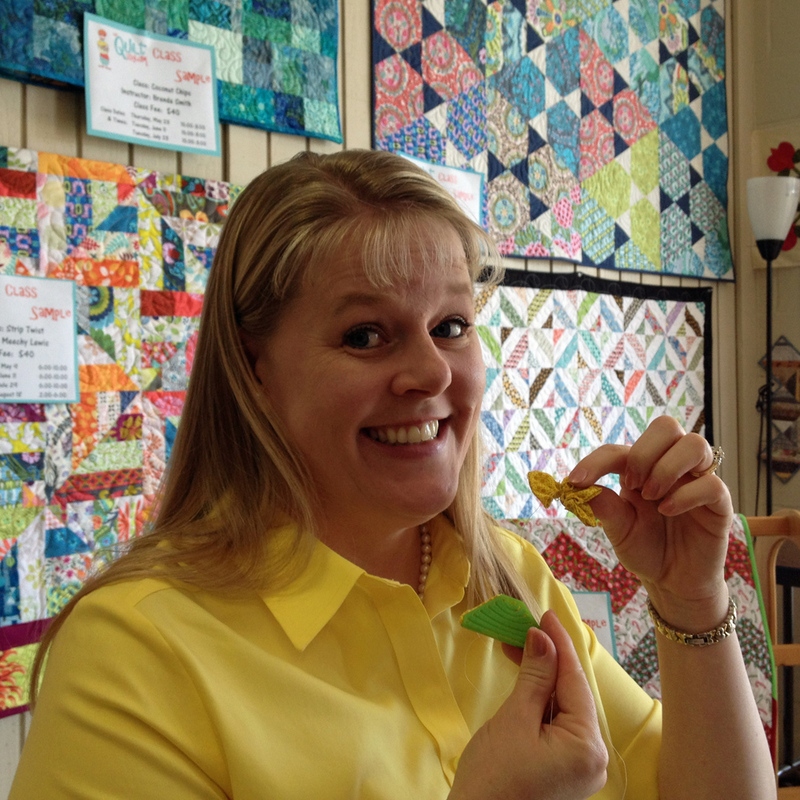 May Flaum's newest workshop, Camp Scrap 2013, began yesterday at BPC. 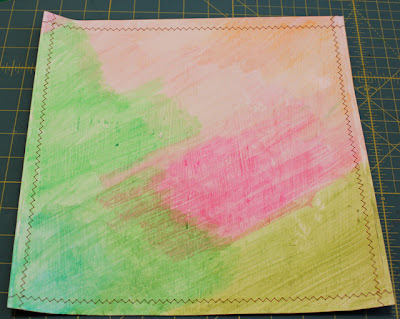 I've been debating whether or not to sign up for any new classes this summer, but finally decided to take the plunge with Camp Scrap - and I'm already thrilled that I did. This four-week workshop is packed with inspiration! I've reviewed the Pre-Class and Week One materials and have already completed one layout and have ideas for quite a few more that I'll be working on today. Each week, May provides three mini-classes (like workshops you would sign up for at a summer camp) complete with a video and handout. 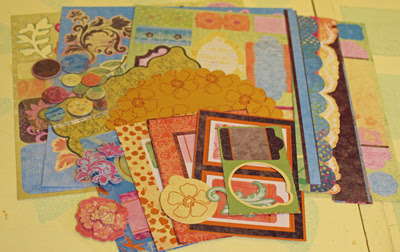 The first mini-class this week was all about using a kit to get started scrapping. As many of you know, I don't use a lot of kits. However, I happened to have a kit, actually I think it's a collection, that I've had in a Materials File for a while. 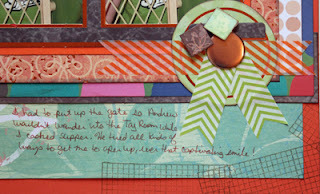 I decided to pull it out for my first set of layouts during Camp Scrap. 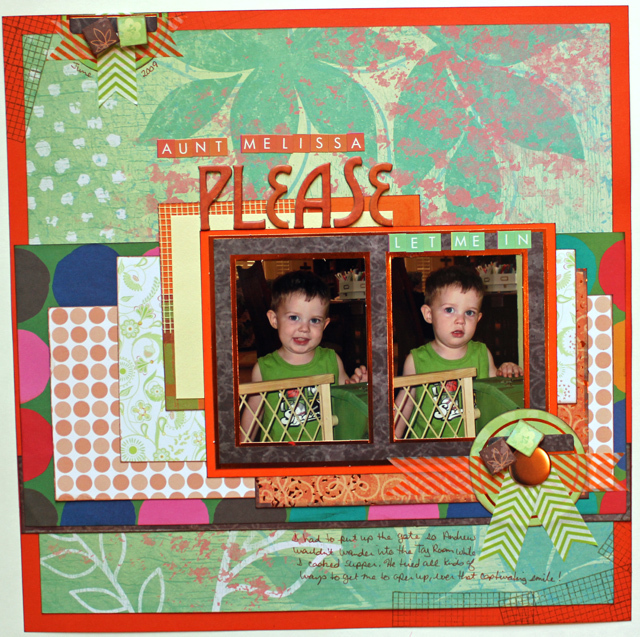 Embellishments - frames, die-cuts, punch-out pieces, buttons, and borders. And three sheets of letters. Rather than add items to the kit, I decided to simply determine the need for additional items as I created my layouts. 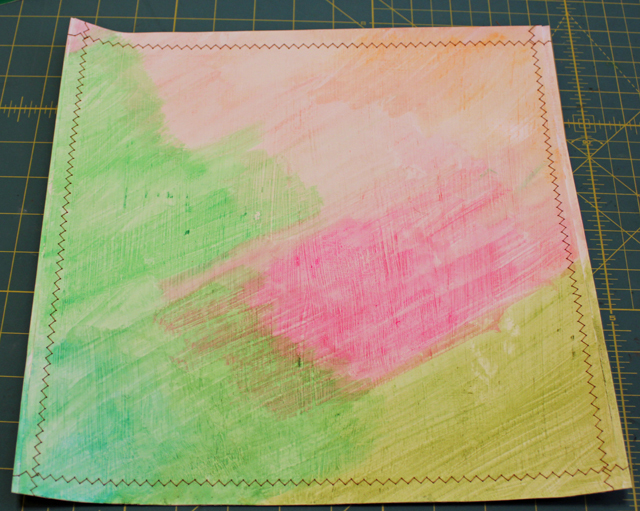 The second mini-class this week in Camp Scrap is to use stamping to complete a layout, so I've also set a goal to use my stamps more. Here's a look at my first layout using this kit. 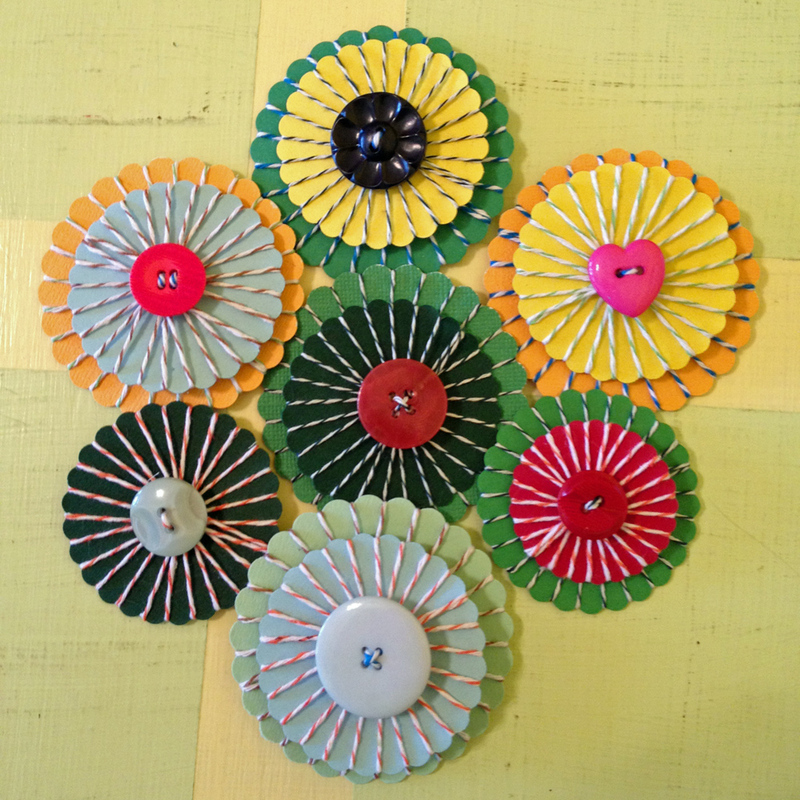 I added some embroidery floss to the buttons and used two stamps on this layout - a large flower and an arrow border. Here's a closer look. BTW - did you notice in the kit photos that a few items were missing? 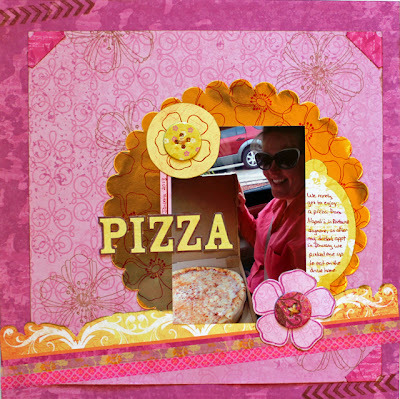 That's because I had used this kit last fall to complete a layout about my friend Josey. So, this is actually my second layout with this kit! Are you signed up for Camp Scrap? There's still time to join in and enjoy all the inspiration! 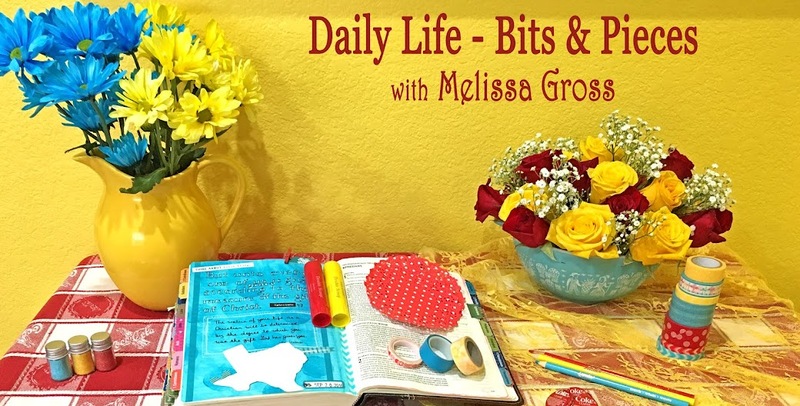 Besides the three mini-classes each week, the workshop includes a weekly make & take, four chats, daily inspiration emails, and additional challenges and giveaways on the message board. 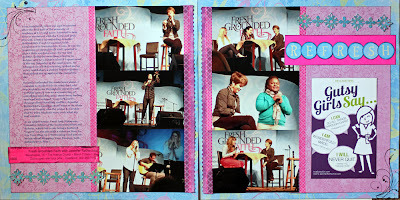 I've decided it's time to finish up my 2009 scrapbook, so I recently went through my completed layouts and my remaining printed photos & memorabilia to determine which stories I needed to scrap to complete it. I realized that I needed an introduction page for the album, and I chose a divided page protector and photos of our home as the title page. 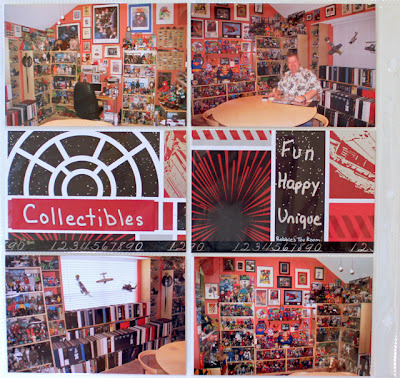 Of course, this meant that I needed to fill in the back of that divided sheet, so I chose to highlight photos of Robbie in his collectibles room. 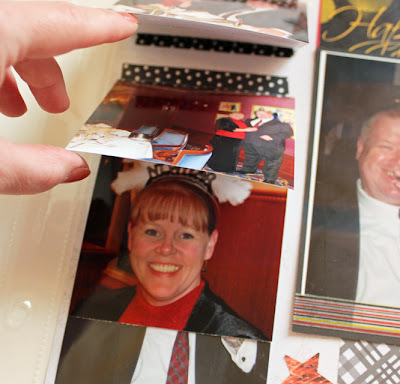 I really like how these page protectors allow me to create quick and simple layouts when I have a group of 4x6 photos to showcase, yet there's still room to add some patterned paper or cardstock or a sticker or even some washi tape! Watch for more layouts from 2009 as I continue recording the stories from that year! Do you have any albums or projects that you want to complete this summer? A few quick reviews for you of some of the books I completed April and May. 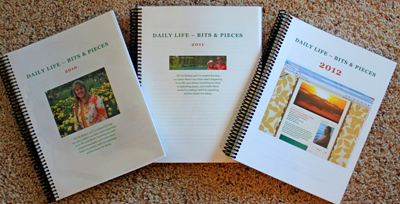 Six of the books were from The Spirit of Simple Living Series published by Guideposts. I've read a few of these books before and have had them on the bookshelf for several years, so I decided to read through them all as I make plans for the summer and enjoy being back to my "regular" schedule now that school has ended. These books are pretty easy reads and packed with great information - the two I most enjoyed were The Simple Home with ideas for simplifying your home and making it work for you and your family and Healthy Living since this is one of the things I'm really focusing on lately. I also read Simply You, Finding The Time, Simple Friendships, and Kinship and Community. The Lucky One by Nicholas Sparks has been in my to-read pile for a while. In this story, a US Marine (Logan Thibault) finds a photo while serving in Iraq. After his tour of duty is over, he ends up walking across the country to find the girl in the photo. When he meets her, however, he doesn't tell her about the photo, they fall in love, she finds out & is angry . . . but by that time they are in love. There's a jealous, perverted ex-husband, a somewhat "nerdy" son who's an excellent chess player & overall good kid, Logan Thibault's dog Zeus, and Nana who tells it like it is. This is a great story with a few twists and turns and a satisfying ending despite tragedy along the way. Here's one of my favorite quotes from the book: sometimes the most ordinary things could be made extraordinary, simply by doing them with the right people. These next three books I read on my Kindle. As I read more and more books on Kindle, I've discovered that some books work better than others in that format. For me, fiction books are great on the e-reader, however non-fiction don't seem to flow as well because I can't easily flip back to a page or check something I've highlighted (although I understand this can be done on the Kindle if I take time to learn to use it proficiently!). I don't remember where I heard about 42 Days to Fit, but I remember downloading it free from the Kindle store as part of my initiative to read books on healthy living. This book was written primarily for moms trying to lose baby fat (so obviously some of the information was irrelevant), however there were food & exercise challenges each week and some good advice along the way. There were also links to videos and recipes, however to me that disrupts the flow of reading so I didn't visit any of the links. On Becoming a Writer: What Every Blogger Needs to Know by Denise J. Hughes was another free download for the Kindle. This book contained good basic information about writing, but this is one I felt like I would have liked better in a paper format. I also read F. Scott Fitzgerald's The Great Gatsby since it's been years since I've read it and we just might decide to check out the new movie soon. This was a good book for the Kindle because it's fiction, not too long, and was a free download (do you see a pattern here?). I've updated my sidebar list with the books I'll be reading in June. What are you reading this summer?